Jules Verne would be so proud. Scientists at the University of Central Florida (UCF) have teamed up with space and mining tech company Honeybee Robotics to make a small, microwave-sized spacecraft that uses water for fuel and has the ability to drill for more as it goes along its journey. The duo also took advantage of the National Aeronautics and Space Administration's (NASA) Small Business Space Technology Transfer program for partnership funding. The program is designed to facilitate these sorts of collaborative projects to produce marketable commercial space-related products, the UCF statement notes. Dubbed "WINE" for the World is Not Enough, the spacecraft is the product of three years of development. It's not simply a bucket of bolts and iron for Karl Marx to wax lyrical about, but a finely tuned device capable of operating in the unique demands of various gravitational situations, with solar panels to collect electricity for kickstarting its steam production, Phys.org reported. Another option would be one commonly used by spacecraft already: a small amount of radioactive material that provides heat as it decays. 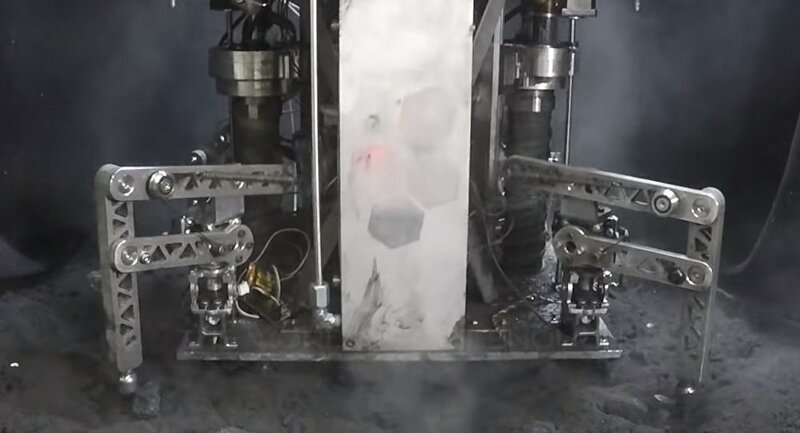 Honeybee and UCF recently tested WINE on a simulated asteroid surface in California, successfully landing on a fake comet, extracting its required water fuel and blasting off again. "It's awesome," Phil Metzger, a UCF space scientist who helped design the steampunk starship, says of the demonstration in a January 10 statement. "WINE successfully mined the soil, made rocket propellant and launched itself on a jet of steam extracted from the simulant. We could potentially use this technology to hop on the Moon, Ceres, Europa, Titan, Pluto, the poles of Mercury, asteroids — anywhere there is water and sufficiently low gravity." Metzger noted that WINE's primary appeal will be the cost of fueling spacecraft as well as the practical limits set by the amount of propellant any ship can take with it. "Each time we lose our tremendous investment in time and money that we spent building and sending the spacecraft to its target," Metzger said in the statement. "WINE was designed to never run out of propellant, so exploration will be less expensive. It also allows us to explore in a shorter amount of time, since we don't have to wait for years as a new spacecraft travels from Earth each time." The result, Metzger notes, is that WINE can theoretically explore celestial objects "forever." Just remember: in space, there's nothing keeping your top hat on your head.